Secret Empire is a Marvel hitting the shelves in June of 2017, the event will be broken down into different phases with each phase hitting during a month. The first phase is United We Stand and the 2nd phase is Hydra Takeover. The Hydra Takeover story is designed to coincide with the Agents of Hydra story line getting ready to be launched on Agents of SHIELD. The event spin out of the revelation that Captain America has been a life long Hydra agent and is now prepared to release the full breadth of his sinister plan to take over the country. Secret Empire is planned to be 9 issues including the Secret Empire #0. Secret Empire #1 is due out on shelves May 3. Mystery character on Cover #9 revealed! The reason why this was hidden was because Bucky was killed earlier in the series. Though I have not run into anyone shocked by this. Secret Empire is entering a phase called "Hydra Nation" and have released a trailer to promote it. The trailer highlights the going ons of the cosmic cub as it related to the creation of Hydra Cap and also shows the new Good Captain America that has mysteriousily appeared. There are two Captain Americas and one seems to be loyal to the United States and one is Hydra. It is likely that one of the two is actually the Ultimate Captain America. It could also be that the cube created two different versions of Captain America but how they could both exist in the same dimension would seem to be pretty weird. Hydra Captain America can lift Thor's hammer. Punisher is also in league with Hydra. Marvel has stepped on another landmine .......again. They reached out to comic store workers asking them to wear Hydra shirts for the promotion of the event. 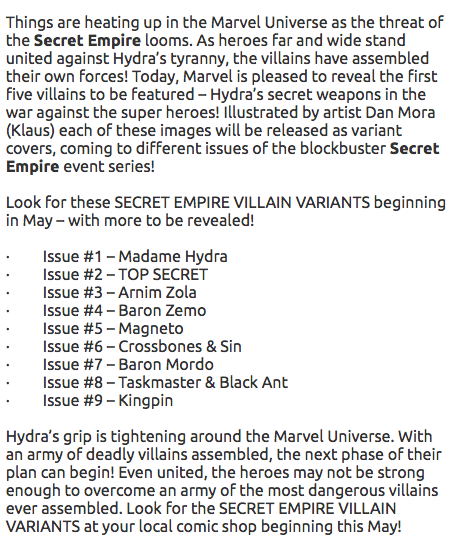 Marvel will be partnering with various websites and brick and mortar locations in the first week of June to roll out the Hydra Takeover phase of Secret Empire. The Secret Empire issues #4 and #5 will hit during June. The websites and apps that will take part in the take over have not been listed. Additionally select retail locations will receive special promotional items to give away during the event. I have not found a list of participating comic stores but I would reach out to your local store to see if they are participating. I will update with a list of sites and stores participating when its available. There will a variety of promotional items that will include post cards, pins and cake toppers here are some highlights. Pins featuring both the Hydra SHIELD as well as Captain America's new SHIELD. All Marvel fans will surely want these pins to remember what will no doubt be every Marvel fans most loved event ever. The Coolest promotional Item is a Lenticular Backer Board they come in bundles of 25. For fans of Toylab we would like to say STAY ALERT, Stay Vigilant and report signs of Hydra in our comments section. There will be a set of variants that feature Marvel heroes eerily as members of Hydra. There will also be Villain Cover variants. Secret Empire will feature many awesome covers with a Hydra theme.The covers of Secret Empire are done by the amazing artist Mark Brooks.